Asking members of both houses to join the Congressional Task Force on Down Syndrome. This is a bipartisan and bicameral task force that works to increase awareness in Congress about Down syndrome. 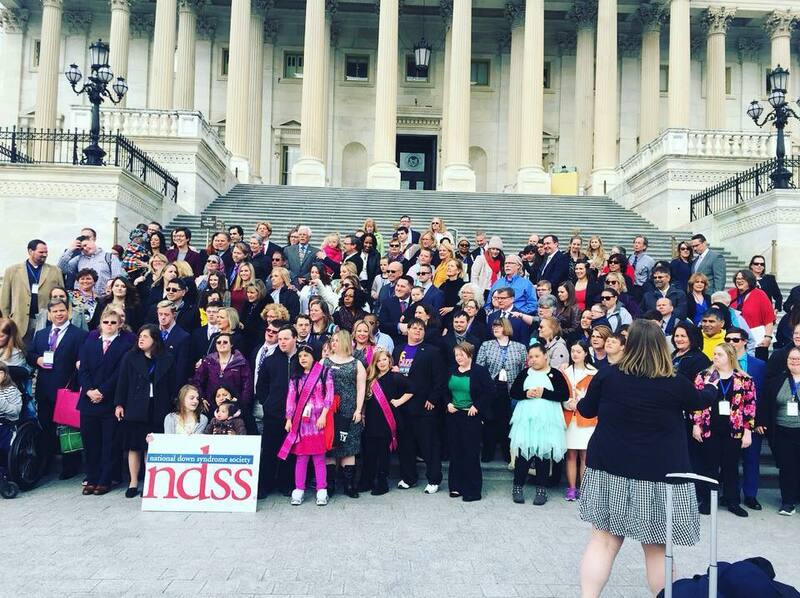 Asking all members to support increasing the NIH’s research on Down syndrome. Asking members of the House to cosponsor the Medical Improvement of Neurodegenerative Diseases (MIND) Act to direct the VA to establish centers for Alzheimer’s Research. Asking members of the House to cosponsor the Transition to Integrated, Meaningful Employment (TIME) Act which will phase out special wage certificates under the Fair Labor Standards Act of 1938. Under this act, individuals with disabilities may be employed at sub-minimum wage rates. Asking members of both houses to retain and improve higher education programs for students with intellectual disabilities. Asking members to cosponsor the bipartisan Advancing Care for Exceptional (ACE) Kids Act to improve the process by which children with Down syndrome who participate in the Medicaid program, and who have other complex medical conditions, are able to obtain care and coordinated treatments. So, we had a full day ahead of us. We began the day with a group photo of all the attendees and individual families. Then it was down to business. The first meeting was with Sen. Kirsten Gillibrand’s office. Check out some photos of our advocates, self-advocates, and siblings making the case for change. When it was time for lunch, we were pleased to have Senator Schumer and Representatives Cathy McMorris Rodgers and Pete Sessions (Co-Chairs of the Congressional Task Force on Down Syndrome) speak. The afternoon meetings included Rep. Chris Collins and Rep. John Faso. We wrapped the day exhausted, but filled with hope for the future of our community. We can’t thank our country’s leaders enough for taking the time to talk with us. We’re already looking forward to doing it again next year! Next Next post: Inclusive Education at its Finest! !